Title: "And One For All"
Nova is introduced to Drax and Cammi and Drax explains they need Nova's help. Drax realizes that, as a member of the Nova Corps, Nova has access to codes to ships which can get them off the ruins of Xandar's Orienta Shard. Nova tells them that he can't help them and advised them to get away from him as he is extremely dangerous right now. Drax points out that Nova can't be any more dangerous than those who caused the destruction they've just survived. Nova agrees and Drax realizes that Rich Rider is from Earth. Rich asks how he knows that and Drax informs him that it's his scent. Cammi tells Nova that she's also from Earth and lived in Coot's Bluff, Alaska. As Cammi begins to flirt with Rich, the WorldMind begins communicating with Nova through the visual interface in his helmet. The WorldMind and Nova begin arguing about what course of action to take with Nova wanting to get Drax and Cammi to safety while the WorldMind is concerned with finding a secure location for itself. 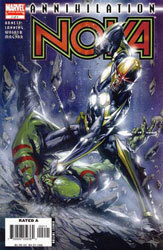 The artificial intelligence informs Nova that he has identified Drax as the mass murderer known as Drax the Destroyer. Nova is more concerned with protecting them but asks Drax about his identity. Drax denies being the same man as the Destroyer. Nova doesn't believe him but he agrees to help them find a ship. The WorldMind and Nova continue arguing until the young hero admits that he's scared to use the immense powers he now holds because he's afraid he'll lose control again. Despite its disapproval, the WorldMind instructs Nova to go to the hangars on Sub-Level 8613. Ninety minutes later, the three of them reach the hangar but find the ships being devoured by the alien invaders of the Annihilation Wave. They attempt to escape to Sub-Level 3415 before they're discovered but it's too late! While running from the invaders, the WorldMind commands Nova to access the Nova Force and destroy their attackers. Drax falls behind fighting the aliens as Nova and Cammi find themselves face to face with one of the attackers! Before he can strike a killing blow to Cammi, the alien is struck down by Drax who has hurled a weapon through it! Afterwards, Drax demands to know why Nova didn't protect Cammi with his power. Nova doesn't want to talk about it and walks away. The WorldMind also begins arguing with Rich about his failure to act. The young Earth man tells both of them that he has had enough of them and, throwing his helmet to Drax, suggests they talk it out between themselves. Drax puts on Nova's helmet and begins talking to the WorldMind. Meanwhile, Cammi talks to Nova and listens while he explains that he has survivor's guilt about Xandar. Cammi only listens for a little while and then asks Nova how he got his powers. He tells her that he was given his powers and Cammi wants to know how she can get super-powers. Drax interrupts their conversation and tells Rich that the WorldMind has explained the situation to him. The alien offers to train Nova how to focus his powers and control them. On Sub-Level 3415, the three refugees find a functioning ship and prepare to leave Xandar. After reading the ship's monitors, Nova points out that the Orienta Shard is surrounded by an armada of Annihilation Wave ships! Drax instructs Nova to use the Nova Force to form a StarGate when they leave the hangar as it's the only way to escape destruction. Rich is hesitant but Drax assures him that he will help him through it. The ship leaves Xandar and Nova begins to open the StarGate. It's painful but Nova continues to open the gate. Drax offers encouragement by telling the hero that he'll kill him if he doesn't succeed. Nova completes the StarGate and the ship escapes the Annihilation Wave. Nine light years away, the ship flies out of the StarGate near the planet Nycos Aristedes. However, the ship's systems are off-line and they begin to fall uncontrollably towards the atmosphere! As the ship becomes enveloped in fiery plasma from flying into the atmosphere, they suddenly find themselves rescued by the hero from Earth named Quasar!